With Modesty In Mind, TSA Rolls Out New Body Scans Remember last year's uproar over the Transportation Security Administration's revealing body scans? Well, rigorous frisking is still de rigueur, but those body scans are getting a software upgrade. 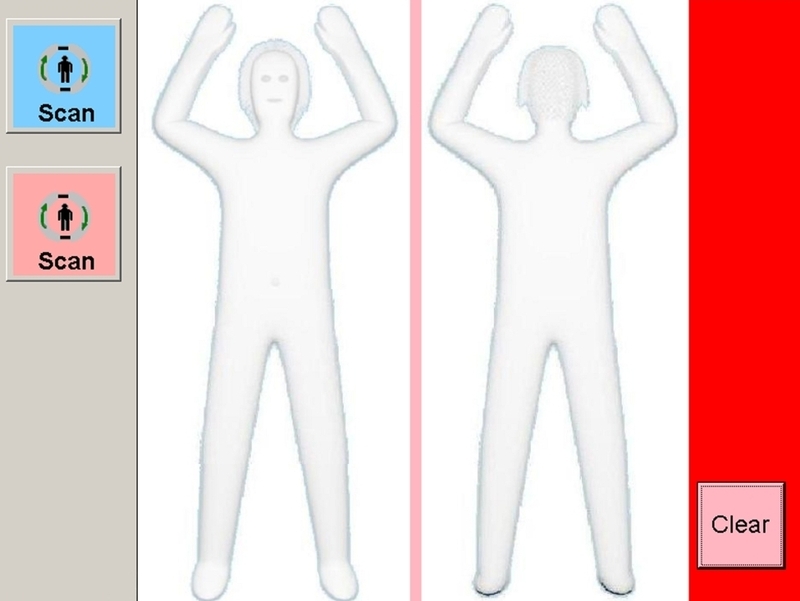 TSA says the scanners will now show only a gray, cookie-cutter image of your body. TSA employees demonstrate the new technology at McCarran International Airport in Las Vegas in February. 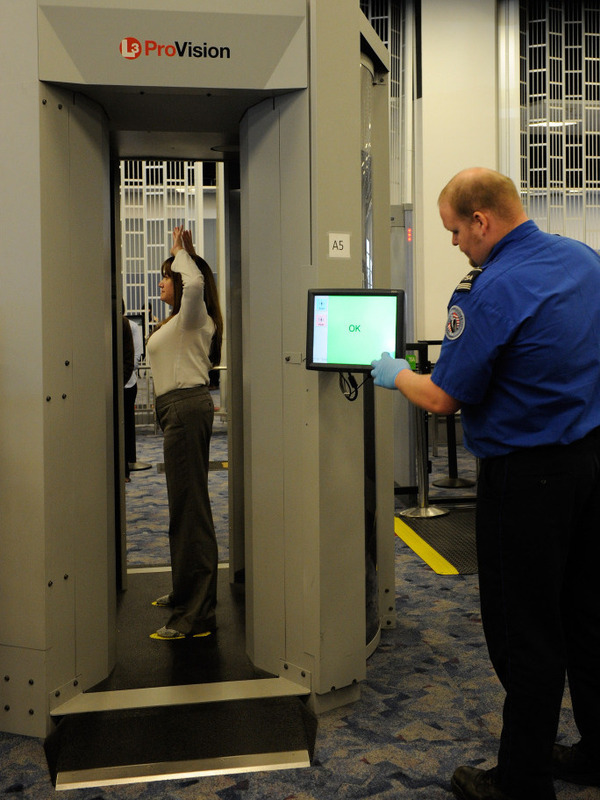 Beginning in 2007, full-body scanners were installed at the nation's airports to address concerns that terrorists could smuggle explosives hidden in their clothing — or, in one infamous case, their underwear — that wouldn't be picked up by standard metal detectors. The scanners produced a fairly detailed image of a traveler's body, which was viewed on monitors by TSA screeners in a separate room. At Reagan National Airport, outside Washington, the software is already in use. TSA screeners look at a standard flat-screen computer monitor that's been bolted to the side of the cylindrical scanner. "After someone comes through the machine, they see the very same thing that the officer sees. And that is, no image of a passenger but instead a generic outline of a human body indicating where the anomaly is," says Kawika Riley, a TSA spokesman. That generic outline has been described as a cookie-cutter image, or gingerbread man. At Reagan National, a 20-something man steps into the scanner. When he steps out, the monitor shows a small yellow square outlined in red on the gingerbread man's hip. It turns out the man had something in his right pocket — a piece of paper. The new Automated Target Recognition software eliminates passenger-specific images and replaces them with generic outlines. "As you can see, the technology did exactly what it was supposed to do, which is detect an item," says Riley. "Fortunately, it was just something that he had left in his wallet, but if it had been a threat, the machine successfully detected it, and it was resolved." TSA Administrator John Pistole says the software upgrades should help ease some travelers' worries about having their nearly naked image examined. "We've actually been working on this for quite awhile, predating any of the controversy about it," he says. "But we believe this does address the privacy concerns that some passengers have raised." A spokeswoman for the Electronic Privacy Information Center, which has sued the TSA over its use of scanners, says the group still wants to see the technical specifications of the new software and whether it can store passengers' images. The TSA says their scanners have never had that capability. By the end of the year, the new software should be in place at many airports.